Middle school • New guidelines have been under fire for out-of-state origins and inclusion of evolution, climate change. 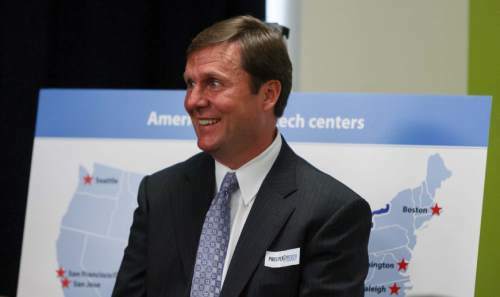 Trent Nelson | The Salt Lake Tribune Stan Lockhart smiles at a press conference where Governor Gary Herbert and Prosperity 2020 (business and education partners) announced a partnership to make Salt Lake a top ten location for technology jobs and businesses. The press conference was held at the World Trade Center in Salt Lake City, Utah, Thursday, September 6, 2012. 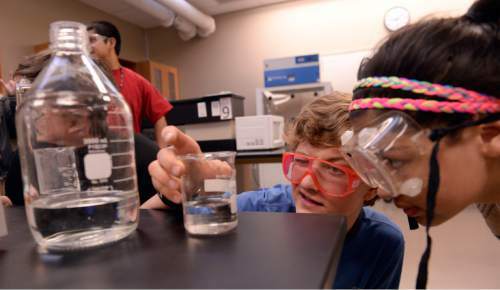 Al Hartmann | The Salt Lake Tribune Salt Lake Center for Science Education tenth-grader Elliot Hamilton takes measurement during an experiment in making biodiesel from used cooking oils from local restaurants Tuesday April 7, 2015. The state school board will vote this week on advancing new science standards that emphasize engineering and hands-on experimentation. 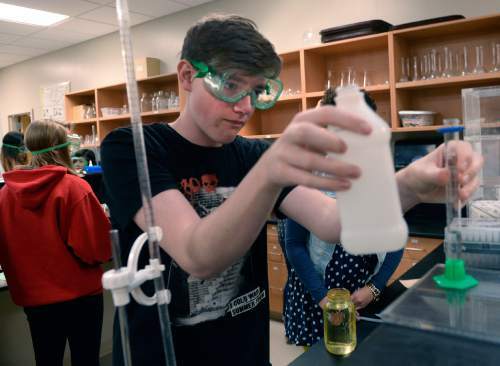 Al Hartmann | The Salt Lake Tribune Tenth-grade students at the Salt Lake Center for Science Education do experiments making biodiesel from used cooking oils from local restaurants Tuesday April 7, 2015. The state school board will vote this week on advancing new science standards that emphasize engineering and hands-on experimentation. 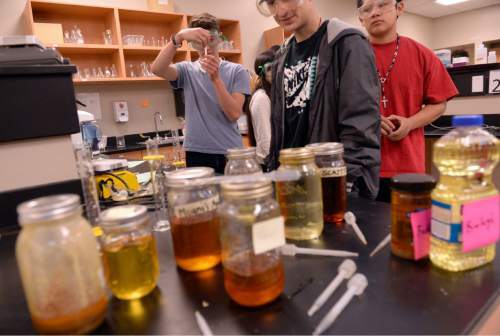 Al Hartmann | The Salt Lake Tribune Salt Lake Center for Science Education tenth-grade students Landis Baxter-Howard and Chantelle Vanegas measure KOH in an experiment to make biodiesel from used cooking oils from local restaurants Tuesday April 7, 2015. The state school board will vote this week on advancing new science standards that emphasize engineering and hands-on experimentation. School board member Stan Lockhart started Friday&apos;s state education meeting with a message about his relationship with God. He spoke of the comfort he received after the death of his wife, former House Speaker Becky Lockhart, and how he had come to know God well during sleepless nights. Lockhart then pivoted to the new statewide science standards the board would later debate and finally pass. God is part of science, Lockhart said, and there&apos;s a tendency to ignore the divine in education policy. "We cannot take God out of existence with our school system," he said. Despite those reservations, Lockhart was among the 11 board members who voted to adopt the new standards, which update the expectations for science classes in grades six, seven and eight. The standards add a significant engineering element to middle school courses, emphasizing hands-on experimentation and problem-solving. But they have been dogged by criticism for their out-of-state origins and their inclusion of topics like evolution and climate change. Four board members opposed the changes. And prior to adoption, Lockhart attempted to include an introduction to the standards specifying that students are learning scientific theories and not facts. That amendment was defeated. "I actually don&apos;t agree with some of the theories that are being taught," he said. Friday&apos;s vote closes a tumultuous two-year process for the state Office of Education, which submitted several drafts of the new standards to the school board and hosted a series of heated town hall meetings throughout Utah. As for plans to update the state&apos;s elementary and high school science standards, State Superintendent Brad Smith said there is currently no schedule set. "That question is a lot like asking a woman who just delivered a baby when number two is coming," he said. The first draft of the middle school updates were largely based on the Next Generation Science Standards (NGSS), a series of educational benchmarks developed by a consortium of national experts. The similarity rankled conservatives, who accused the state office of copying and pasting a national agenda in lieu of home-grown education policy. But after two periods of public review, and two subsequent rewrites, school board Vice Chairman David Thomas said roughly one-third of the final product was aligned with Next Generation. "These aren&apos;t NGSS standards," he said. "We depoliticized the standards, and at the same time we&apos;re still living true to teaching science fact as well as scientific method." The new standards, which outline the skills and topics a student should master in each grade, will be implemented statewide during the 2018-2019 school year following a pilot year beginning in fall 2017. Ricky Scott, a science specialist with the State Office of Education, said there is a need to prepare students for 21st century careers. And Utah policymakers are pushing for investments in STEM education, an acronym for science, technology, engineering and mathematics. Those efforts are undercut, he said, by antiquated classroom instruction. "That &apos;S&apos; is a crucial part of that [acronym]," Scott said. "We cannot do that with 13-year-old science standards that do not meet those needs." School administrators and science teachers maintain flexibility over classroom materials and lessons plans, and will receive training on the application and expectations of the new guidelines, Scott said. "It&apos;s time," he said. "Teachers and districts and charters ... [and] scientists in general have been waiting for this." But Heather Gardner, a former educator and Davis County parent, said the standards are too prescriptive, effectively dictating a statewide and potentially national curriculum. She said she was proud of the four opposing board members, who listened fairly to the feedback from their constituents. "I don&apos;t feel there&apos;s enough flexibility," she said. "I would love to see more local control." During a public comment portion of the meeting, Salt Lake County parent Jason Stevenson told board members that science doesn&apos;t care if Utah goes its own way. But effective and accurate education will ignite the curiosity of Utah&apos;s students, he said, preparing them to participate in the groundbreaking research of the future. "It starts with a commitment to real science education in Utah that you can make today," he said.